My previous excerpts from my novel Atterwald have introduced the three major point-of-view characters. Brendis the lovelorn mouse-man has transformed into Baltasar the sorcerer. Meinrad has seen visions beyond his sick-bed. The outcast rat-child who calls herself “the Dying One” has been adopted by respectable mouse-woman Ricarda and given a name, Nicht Naught Nothing, or “Nichtel.” In the following scene, the three come together for the first time. Tall unshuttered windows lined the upstairs corridor Nichtel and Baltasar walked along. White-gold sunlight flooded the hallway, singing of the pleasures to be found outdoors. Restlessly she quickened her pace. 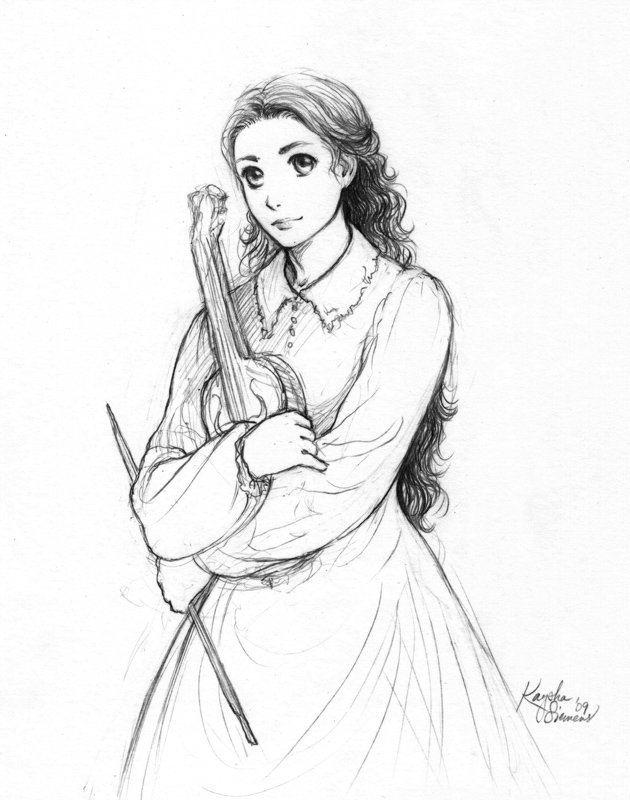 She grinned at the fiddle-shaped bundle under her arm, anticipating the melodies she might find once she took her violin out into the garden. Intervals already filled her fancy. But first she had to make someone’s acquaintance. She recited silently all the rules Ricarda had taught her about making a good impression. “Here we are,” Baltasar half-sang as he reached a door marked with gold-gilt letters, M-R. He turned the knob and stepped into shadow, beckoning for Nichtel to follow. She could tell at once that light and fresh air were strangers to this room. As Baltasar pulled the door closed behind her the meager glow of his candle revealed faded green walls, an ebony writing-desk topped with books and a bottle of ink, dust-dappled green plush chairs, and a four-poster bed with sheer white drapery. A window hovered over the bed, its blinds drawn fast. Tiny fingers of light struggled through the swirling dust-mites to fall upon the bed’s occupant. A man — or was he a boy? — lay propped on a mound of pillows, a thin hand dangling over the bedside. He lifted his eyelids to acknowledge the newcomers. His thin lips tightened, as if their intrusion displeased him. “How are you feeling this happy hour, my boy?” Baltasar asked, his voice so gentle that Nichtel hiccoughed in surprise. Nichtel curtseyed and greeted Baltasar’s son. Her gaze took him in and wondered. He was in every way the reverse of his father. Baltasar had no scent, yet Meinrad’s mouse-scent was distinct. Baltasar was small and round, yet Meinrad was lank, all angles and edges. The father’s face bore a healthy red tint, while the son’s sunken visage was deathly pale, crowned with a mop of frowsy light blond hair. “The autumn,” Meinrad put in, reflexively. “There, you see? Dying,” he snapped, folding his arms. Nichtel gnawed at her lip. She heard and felt no music in this stifling room. “I’ve never played indoors,” she told Baltasar. “Then I suggest you try,” he returned. With lead-heavy fingers she drew her violin and bow from their cloth cover. The fiddle did not quiver at her touch, as it always had before. Nonetheless, she tucked it under her chin and set the bow in place. Closing her eyes, she cast the net of her memory around the happiest moment she had known so far — the morning when she’d found a cake and a birthday crown at her place at the breakfast table and afterward had rushed out into the spring and played her fiddle with such merry abandon that the sunlight itself had danced. Play that moment, she urged herself and set her bow and fingers in motion. Her heart raced, jubilant, as the jig-like strain rushed forth. She could make music indoors, as long as she remembered the wind’s whispers and touch. Her playing grew louder, stronger, until she imagined herself back in that first birthday, under the fahrian eln with Hulbert and Adelyte kneeling beside her. At any minute Ricarda would call them in to lunch. Her eyelids fluttered as the music slowed, then stopped. She expected Meinrad to snap that as ill as he was, a change in the tempo could hardly matter. But he kept silent, his gaze expectant. Once more she closed her eyes, calling other images to mind: soft moonlight falling through the curtain upon Ricarda and her youngsters as they slept, the curtains stirring in a faint breath of wind, the steady whirr of crickets, even a house’s tiny creaks when all is peaceful. From these threads she wove a nocturne. A hand touched her back. She turned lazily, half-expecting to look into Ricarda’s careworn face. Instead she found Baltasar, beaming. “Behold,” he said, with a wave of his hand toward the bed where Meinrad lay, fast asleep. . .
Atterwald‘s third main point-of-view character, the central protagonist, is a hal’ryth’kei of the Rat Tribe, and has lived among the nomadic bandits thinking she has two choices: grow up to become like them, or die. She believes the latter might be a better option. Yet in this excerpt, she finds herself unexpectedly liberated from her lawless comrades. A swish, and suddenly she felt light and free. Her tether had been cut. You’ve been a captive, something whispered in her ear, no different from that poor mouse-man with the crooked chin. What do captives do when they have the chance? Her lips formed the word. Escape. She raced toward the nearest tree to hide. She clutched her knees and let herself blubber, she ventured to hope, for the last time. Drawing in the bark’s damp scent, she understood suddenly that this lovely phrase was the tree’s secret name. She sensed as it swirled gently around her that the wind was befriending her, touching her and speaking to her as no other being ever had. She yearned to remain here where she would be safe, or at least slip out of life happily, at peace for the first time. The wind-whispers wafted in circles about each other, forming patterns she envisioned as glowing spirals of color and light. She heard them leaping and racing, winding and diving. In this dance she sensed an invitation to discovery. She listened with every atom of her being. She loved the word and at times thought she understood it. Though her elders’ raucous shouting offered her no example, she sensed it in the rustling leaves and whispering grass. Here, in the weavings of the wind, she caught it at last — music. She needed to hear it more closely. Willing her transformation, she spun downward, like slipping down a waterfall stone. Her head pitched dreamily as her senses sharpened. The harmonies of the wind grew sweeter, moving through her fur and setting her tail a-tingle. She let out a long breath and closed her eyes as they sang her to a peaceful sleep. She awoke to the touch of sun on her face. Yawning, she stretched herself into a human once more. She was bursting with some glorious thing she couldn’t quite name. The breath of wind played about her ears. Savoring it, she opened her eyes. White threads of sunlight streamed through a verdant curtain of leaf and limb above her. She stretched out her fingers to them, pondering. What might it be like to rise into the sky, absorbed in these lovely strings of light? The wind ruffled the leaves under the child’s hand. As she moved her fingers, they struck something odd. Soft, smooth, slippery. A cloth of some kind. The sketch of the dancing children flashed in her mind’s eye. Had she found one of those fat hair ribbons? Her fingertips tingled as if they’d brushed against ice. Half turning, she glimpsed an object wrapped in a shiny white blanket, lying in a hollow at the tree’s roots. She reached in to draw it out. Her breath in her throat, she unfolded the blanket, uncovering a wooden rod and a thing she had never seen before. The breeze strengthened. She heard it whispering something about this strange object. She strove to think of something, anything it resembled. A figure… like her own if she were attired as she wished to be — long neck, curved bosom, waist, and spreading skirt. She liked the feel of her fingertips along its edges. A gust blowing across the strings made a heart-stirring sound. She heard the faint but distinct suggestion of music — those glorious harmonies the breezes had sung. This thing could make sounds like that. Yet how? She shuddered, breathless as she noticed the stick, too, had strings bound and drawn tight to it. String against string. Heart tight with anticipation, she scraped the stick’s strings across the strings of the larger object. All this effort got her was a high-pitched shriek. She ground her teeth in annoyance, but her heart wound tighter still. The thing shivered under her fingers. It lived, somehow. If she moved the stick-strings and touched the thing-strings just so, she could unlock its soul. She tried again. Still it screamed at her. Startled, the Dying One dropped the objects. Here is another excerpt from Atterwald, introducing the story’s second major point-of-view character. Meinrad lay in bed, his coverlet drawn up to his chin. To ease his racking pain, he was trying to turn himself to stone after the fashion of Grave Limring in The Golden Prophecy. He drew a deep breath up from his toes, then centered his mind on them, willing them to numbness. He felt them freeze and harden and he managed a tiny smile. He coaxed the stone upward into his soles, his heels, his ankles. Soon he could feel only heavy rocks where his feet had been. Pain had no power over rock. Into his calves, up to his knees the brittle numbness spread. As well as the trick was working this morning, he might succeed, as Limring had done, in suspending his breath. When Leoda arrived with her wash-basin and her mirror, she might believe he’d died during the night. She would hold the mirror to his lips, but no fog would mar it. When she lifted the blanket to cover his face he would spring into motion. She would drop her basin and fly from the room, shrieking. When the stone had gained his neck the door opened, and a portly figure appeared, wheeling a tray topped with a basin and a lit candle. “Good mo-o-orning, Master Meinra-a-ad!” the figure called in a chirpy sing-song. The stone in his limbs gave way to a tingle of longing to throw something breakable. “Did you sleep well last night, Master Meinrad?” Leoda asked as she wheeled the cart to his bedside. “I slept as I always do,” Meinrad grunted, forcing himself to look the housekeeper in the face. A wave of revulsion broke in his stomach at the broad smile, the sparkling dark eyes, the gray hair knotted and drawn back to fit under a white lace cap. She always beamed, as if her visits to his sick-chamber were the greatest pleasure life afforded her. “Lovely,” he mumbled while his heartbeat quickened. “Is that all?” he returned with a lazy yawn. Leoda continued her work, turning him from his side to his stomach as she soaped him down. “He’s coming at your father’s request to have a look at you,” she said. This weekend is an exciting one for me: my first signing and public reading of Atterwald! I’ll be getting together with some of my fellow authors at Gilded Dragonfly Books, and in addition to my novel, we’ll also be selling and signing the anthology Finding Love’s Magic and C.C. Ansardi’s novel Shaman Woman. It all takes place at Cafe’ JAYA in Stone Mountain, GA, this Sunday, June 7, between 2:30 and 5:30 p.m.
What better time to share an excerpt from Atterwald, the first in a series. 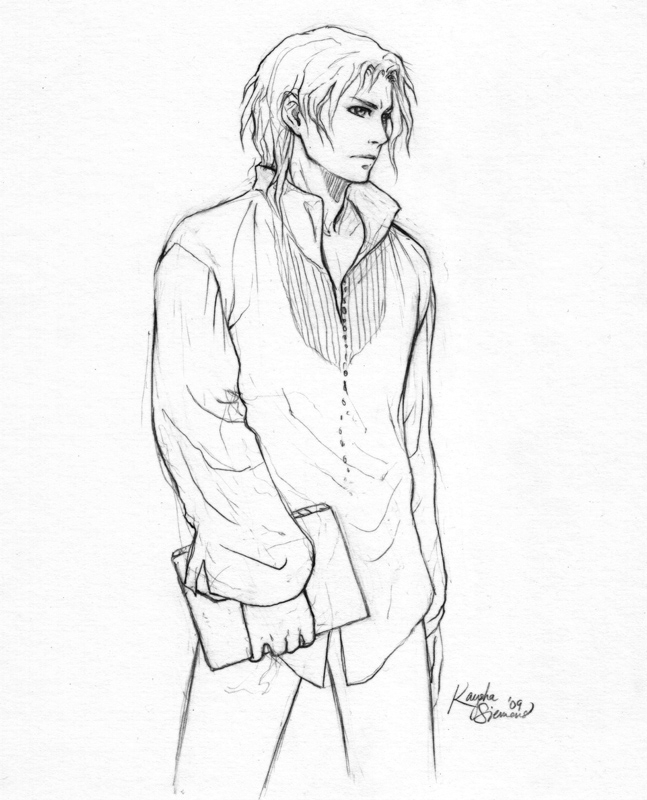 This one introduces Brendis, a young hal’ryth’kei (shape-shifter) in the throes of a first crush. Brendis had always loved to watch the owl-people parade into view at sunset, riding proud upon their deer. Lately, however, he had a special reason to stare. He laid his hoe down at his feet, licked his upper lip and frowned at the stinging salty taste of sweat. He looked up and out toward the rim of trees on the horizon. He held his breath at the clop of deer’s hooves…. The first owls emerged from the wood — silver-haired gentlemen in top hats and black, sharply tailored frock coats, nodding with regal condescension at the mouse-people at work in the field. Why they did that, Brendis could not say, for the mouse-folk paid no heed to the parade. Only he seemed to know the owls were even there. More owl-folk appeared, all in neat frock-coats, all with slim, bolt-straight figures. A tiny part of him hated them and their beauty and aristocratic mien. He loathed finding himself transfixed by them. His stomach spun as his special reason rode into view. Unlike the others, she wore a riding-suit of pale gray, with a white kerchief about her neck and a gauzy veil streaming down her back. But even without these odd color choices, she would have stood out from the rest. Some of them might wear their honey-gold hair in ringlets. Some of them might have skin like white rose-petals while others might boast soft oval faces with clear gray eyes, but all these beautiful features combined in her alone. Even they might have added up to nothing but for her smile, so wistful and pensive that he constantly wondered what she might be thinking. Brendis had to think of the golden maiden by some name or other, so he invented one for her, Verina, the Glory of Her People. This satisfied him for now. To present himself to her and learn her true name would content him for good. Brendis had vowed then and there never to ask his mother a serious question again. In the five years since, he’d kept that vow…. The leader of the parade, the tallest and proudest-looking of the silver-haired gentlemen mounted on a six-pointed stag, folded into himself. His shoulders shrank and his arms and limbs retracted, and suddenly, where a man had been a wide-winged gray owl hovered in mid-air. On their leader’s signal the other owl-folk transformed. Brendis, his gaze locked on Verina, saw her melt into a ball of snowy bright feathers. She stretched her wings, and with the others she rose and soared over the jagged treetops. Arne responded with a grunt and a shake of his head. Brendis turned his eyes from his brother to the deepening sunset sky. Where had she disappeared to? What might she be looking on right now? Sometimes, when he thought very hard about her, he could imagine himself flying with her, the wind under his toes. He could even catch the sharp green scent of the pines below. Such fantasies were generally fleeting, but lately they’d been growing clearer, more intense, giving him hope of a time to come when he might linger long enough in the air to tell himself he wasn’t dreaming. In the sky with her was the place he most wished to be. Something strange growing inside him whispered he might find himself there yet.